Pharyngitis is an inflammation of the pharynx, the area in the back of the throat. This inflammation causes the symptom of a sore throat. Although most infectious causes of sore throat are due to viruses, about 5% to 10% of pharyngitis cases result from a bacterial infection. Since the bacteria most often responsible for bacterial pharyngitis is a strain of Streptococcus bacteria, bacterial throat infections are referred to as strep throat. Strep throat is most common in young children between ages 3 and 15, but it can occur in anyone. Strep throat bacteria are spread easily from person to person in close-contact settings, such as schools, households, or day care centers. Classic symptoms of strep throat include a painful sore throat, difficulty swallowing, fever, swollen neck glands, nausea, and headache. 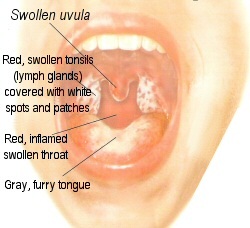 Upon examination, a strep throat appears red, often with white or yellow dots or streaks, tiny red dots on the upper palate, and swollen tonsils. Since a definitive diagnosis cannot be made by symptoms and examination alone, a swab of the throat area is used to detect a bacterial infection using a rapid strep test, followed by a culture if the rapid test is negative. If the throat swab test or culture is positive, an antibiotic is prescribed to stop the infection from spreading and to prevent complications. Although unusual, an untreated strep throat can lead to a sinus or ear infection, abscess of the tonsils, scarlet fever, or more serious complications, such as kidney disease (glomerulonephritis) or heart disease (rheumatic fever). After 24 hours of antibiotic therapy, patients with strep throat are no longer considered contagious and can return to school or work if they have no fever. Most cases of strep throat respond quickly to antibiotic therapy, but patients must finish the entire course of medication to avoid the bacteria returning. If a strep throat returns after appropriate treatment, the source of Streptoccus may be a close contact (who may or may not have symptoms), or the antibiotic was not effective. The symptoms of strep throat include a severe sore throat, especially when swallowing, along with a fever, swollen glands in the neck, headache, and nausea. Sore throats accompanied by cold or flu-like symptoms, such as nasal congestion and cough, are typically caused by a virus, and antibiotics are not effective to kill viruses. To avoid the unnecessary use of antibiotics and development of resistance to antibiotics, the diagnosis of a bacterial infection should be made before antibiotics are prescribed. 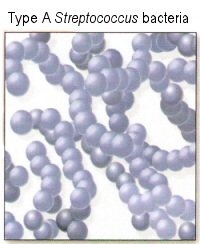 This diagnosis is based on a history of symptoms, a physical examination, and a positive laboratory test or culture for Streptococcus bacteria. Treating Strep Throat: Antibiotics are the appropriate treatment for strep throat since they stop the further spread of bacteria, reduce the risk of spreading the infection to other areas of the body, and help prevent serious complications. There are many antibiotics used in the treatment of strep throat, including oral penicillin VK or injectable penicillin G, amoxicillin or amoxicillin-clavu-lanate, cephalosporins, and macrolides. Factors to consider in the choice of antibiotic include the sensitivity of the bacteria to the antibiotic, patient allergies, how often the antibiotic must be taken, taste, and cost. Antibiotics that must be taken three or four times daily for seven to 10 days are more complicated to take correctly than those taken less often for a shorter period. The taste may also have a big impact on how likely the patient is to finish an oral liquid antibiotic. The cost of the prescription may be an important consideration for some families. Even the side effects, such as the risk of diarrhea, can be a big factor in choosing the best antibiotic for a particular patient. Acetaminophen or ibuprofen is appropriate to treat a fever, but aspirin should not be used in children and teens due to the risk of Reye’s syndrome. Nonprescripnon lozenges and sprays may help soothe a sore throat, and saltwater gargles are effective in reducing sore throat pain. Potential Complications: If left untreated or inadequately treated, Streptococcus pharyngitis can spread to surrounding tissues, causing sinus or ear infections. Some Streptococcus strains can produce a toxin that causes a scarlet fever rash. More serious complications include rheumatic fever (joints become inflamed and heart valves become damaged) and glomerulonephritis (an inflammatory condition of the kidney tissue that can lead to chronic kidney problems). If symptoms of painful or swollen joints, shortness of breath, rash, or dark-colored urine are seen after strep throat, the doctor should be notified immediately, even if the patient has been treated with an antibiotic. Preventing the Spread of Infection: Since Streptococcusbacteria are highly contagious through saliva and nasal secretions, prevention of the spread of strep is similar to viral cold or influenza prevention. This includes hand washing and covering the mouth and nose when coughing or sneezing. Patients should not return to school, day care, or work until they are no longer contagious and have no fever, usually 24 to 48 hours after beginning antibiotics. It is important to finish the entire course of antibiotics even if symptoms disappear, so the infection does not return. If strep throat returns after treatment with antibiotics, there may be close exposure to a strep carrier, a person who carries the Streptococcus bacteria in the throat but has no symptoms of a strep infection. In these cases, it is appropriate to treat the strep carrier to stop recurring infections. Otherwise, strep carriers do not require antibiotics, since they are not at risk of strep infection complications. Streptococcus bacteria can also remain alive on objects such as a toothbrush for several days, so replacing a toothbrush after 24 to 48 hours of antibiotic therapy and thoroughly cleaning orthodontic retainers every day can prevent patients from reinfecting themselves.